This option is the perfect starter FM system for a smaller venue such as a for small churches and houses of worship. Also great for small lecture halls, senior living facilities, or anywhere else where ADA compliant hearing solutions are needed. NOTE: The FM T27 transmitter has a range of 1000 feet. There is no limit to the number of receiver units that can pick up the transmission as long as they within the range of the transmitter. 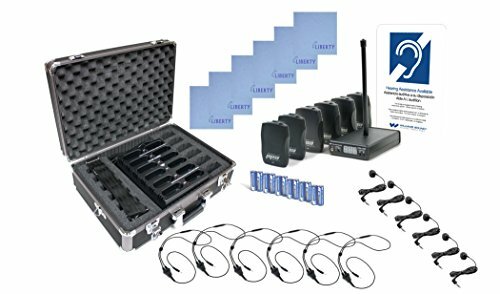 • Includes everything that is needed for FM transmission of a speaker's voice, music, or service audio wirelessly up to 1000 feet. • R37 receivers are interchangeable with other transmitters via the adjustable channel feature. • Users will use the earbud or neckloop to receive audio from the FM R37 receiver. • Standard AA batteries are included. • Audio connections are standard 3.5mm. • Operates on the 72-76 MHz FM frequency.